The Jacobsville aquifer (fig. 133) consists of the Jacobsville Sandstone, which is a feldspathic to quartzitic sandstone and shale that is present along the southern shore of Lake Superior and on the Keweenaw Peninsula in the Upper Peninsula of Michigan. The Jacobsville Sandstone is Precambrian in age and overlies crystalline rocks that also are of Precambrian age as shown in figures 134 and 135. The Jacobsville is overlain by Cambrian and Ordovician rocks to the south (figs. 135, 136) where it thins to a featheredge; its thickness has not been well defined where it is covered by younger rocks. 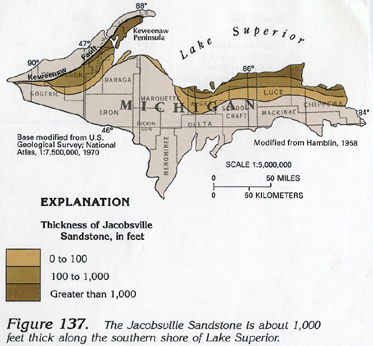 Where the Jacobsville Sandstone is present at the shore of Lake Superior, its thickness is about 1,000 feet (fig. 137). The Jacobsville aquifer provides a source of water for domestic and small-community wells along its area of outcrop, especially where drift is thin or missing (fig. 136). Where the drift is thick, wells are completed in the drift rather than in the underlying bedrock aquifers. 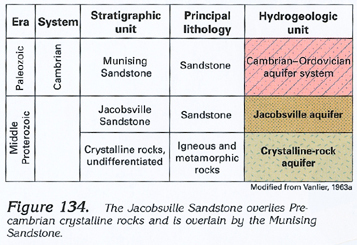 Although the Jacobsville aquifer is a sandstone, it is well cemented and has low permeability. Water moves primarily through joints and fractures in the sandstone, and these openings decrease to insignificance at depths of 100 to 150 feet. Hydraulic-conductivity values are about 1 foot per day, and the aquifer generally is confined. 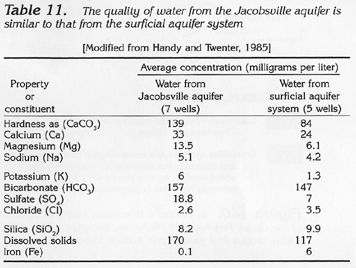 In its area of use, the Jacobsville aquifer contains water that is only slightly more mineralized than water in the surficial aquifer system, as indicated in table 11. Dissolved-solids concentrations in water from the Jacobsville aquifer generally are less than 1,000 milligrams per liter. 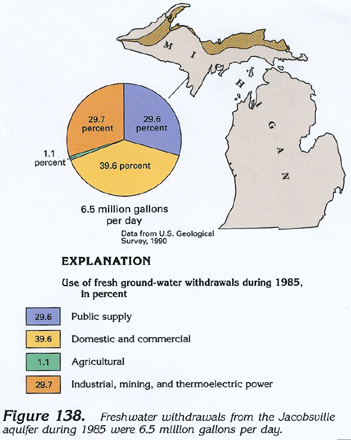 Freshwater withdrawals from the Jacobsville aquifer during 1985 were about 6.5 million gallons per day (fig. 138) which was nearly equally divided between public supply, domestic and commercial, and industrial, mining, and thermoelectric-power uses; only about 1.1 percent of the total withdrawals were pumped for agricultural use. A variety of types of Precambrian crystalline rocks underlies the entire four-State area. These rocks crop out in northern Minnesota and Wisconsin and in the Upper Peninsula of Michigan (fig. 139); elsewhere, however, they are buried beneath younger sedimentary rocks to depths of as much as 14,000 feet (in the Michigan Basin). Crystalline rocks normally are considered a barrier to ground-water movement because their permeability is at least an order of magnitude less than that of most sediments that overlie them. Where no other aquifers are available, however, crystalline rocks are an important source of water, especially for domestic and farm wells. Water generally moves through secondary openings, such as joints, fractures, and faults, in the crystalline rocks. Because these openings are largely insignificant below depths of a few hundred feet, the availability of water is similarly limited to this depth. 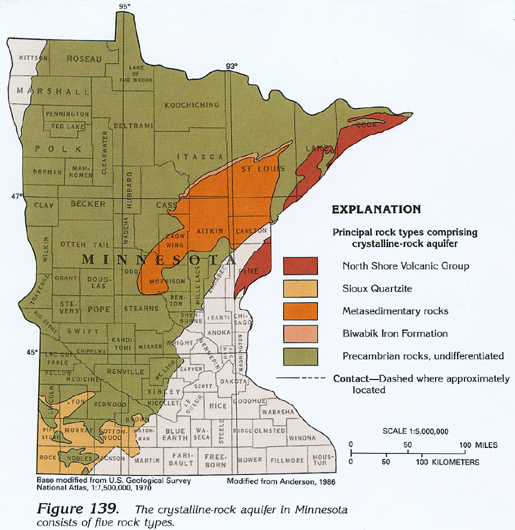 The crystalline-rock aquifer in Minnesota consists of five rock types: the North Shore Volcanic Group, Sioux Quartzite, metasedimentary rocks, the Biwabik Iron Formation, and undifferentiated Precambrian rocks. 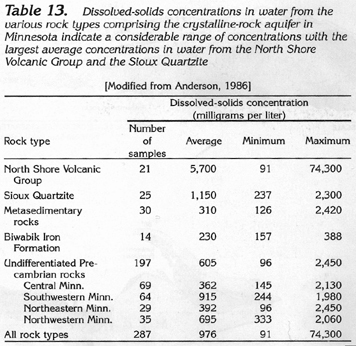 The extent of these rock types is shown in figure 139. 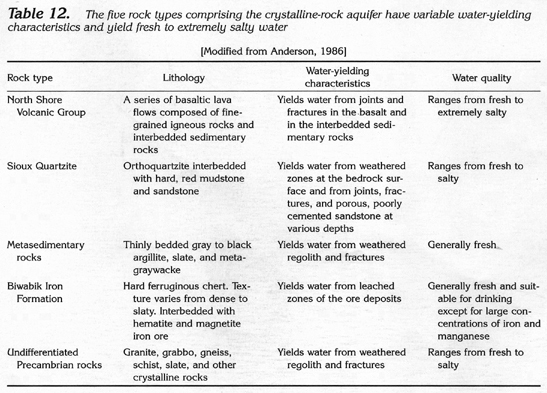 The lithology, water-yielding characteristics, and water quality of each rock type are summarized in table 12. 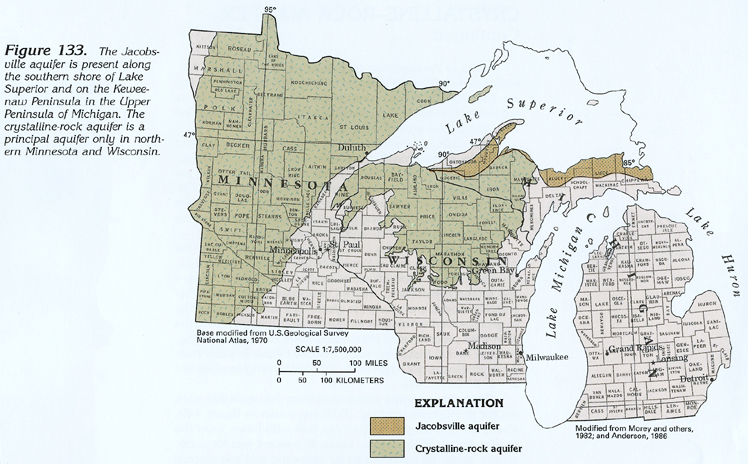 Areas of Precambrian crystalline rocks in northern Wisconsin and the Upper Peninsula of Michigan are shown in figure 140. Water-yielding characteristics of the crystalline rocks are similar to those in Minnesota; small yields can be expected throughout their area of occurrence. 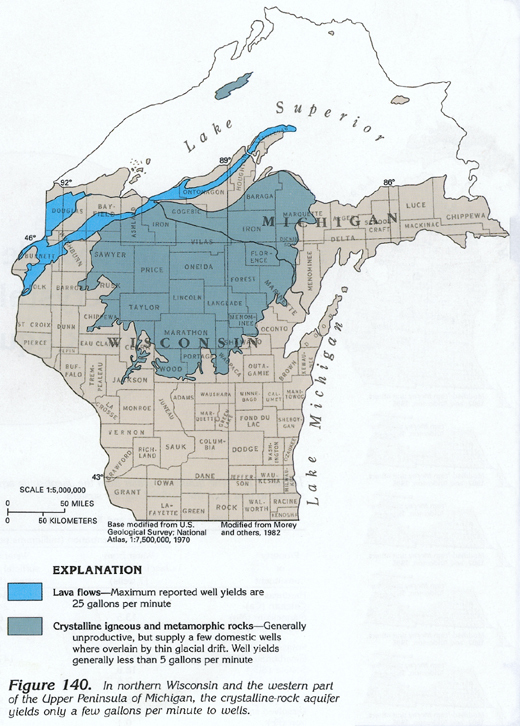 The quality of the water in the crystalline-rock aquifer of Minnesota and Wisconsin is variable. In Minnesota, dissolved-solids concentrations range from less than 100 milligrams per liter to slightly more than 74,000 milligrams per liter (table 13). the freshest water is present in the Biwabik Iron Formation in north-central Minnesota and the saltiest water is present in the North Shore Volcanic Group of northeastern Minnesota. 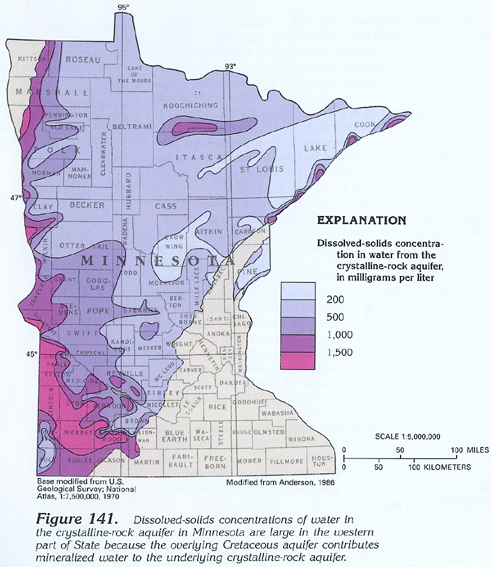 The dissolved-solids concentrations in water from the crystalline-rock aquifer in Minnesota are shown in figure 141. Dissolved-solids concentrations tend to be larger in western and southern Minnesota, where Cretaceous rocks overlie Precambrian rocks and where the glacial deposits are thick. The larger dissolved-solids concentrations probably are due to the downward percolation of mineralized water from the overlying, younger rocks. Dissolved-solids concentrations in water from the crystalline rocks range from 200 to 500 milligrams per liter in much of the State. 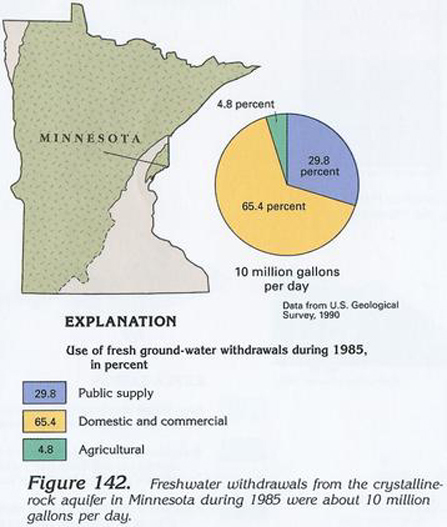 Fresh ground-water withdrawals from the crystalline-rock aquifer in Minnesota during 1985 are shown in figure 142. About 10 million gallons per day was withdrawn from the aquifer during 1985; of that, about 30 percent was for public supply, about 65 percent was for domestic and commercial purposes, and about 5 percent was for agricultural purposes.